PHILADELPHIA, PA – MARCH 13, 2017 – Janney Montgomery Scott LLC (“Janney”), a leading full-service wealth management, financial services and investment banking firm headquartered in Philadelphia, PA, announced that it has hired E. Allen Robinson, Senior Vice President/Wealth Management; Sandra Stoll, First Vice President/Wealth Management; Marvin Snyder, First Vice President/Wealth Management; Burton Daniel, Financial Advisor; and Laura Davis, Private Client Assistant. 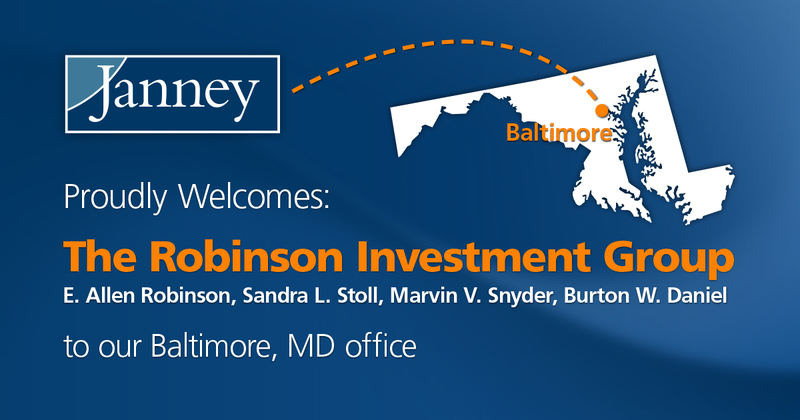 These advisors have joined the firm as The Robinson Investment Group in Janney’s Baltimore, MD branch office. Allen brings to the table over 50 years of business experience, of which over 30 years has been spent in the investment industry. After graduating from Johns Hopkins University in 1962, he joined the family’s retail and real estate business. He was an active member in the Anne Arundel County Chamber of Commerce and Rotary Club. Allen helped found the Summit School for dyslexic children in the Annapolis area, served as its Chairman of the Board for eight years, and continued to serve as an active board member. He is also on the board of the Mount Washington Pediatric Hospital. In the past he has served on the boards of The Alzheimer’s Associations of Maryland, The Red Cross, and several Temple Boards. Allen was also instrumental in fundraising activities for the Johns Hopkins Children’s Center. In 1972, Allen married Elizabeth (Betsy) Rogers of Howard County. They lived with their two daughters, Joy and Alison, in the Annapolis area for 18 years. Prior to entering the securities industry, Allen gained experience in the retail sector as a co-founder of the family’s bridal and formal wear business. In 1983, Allen joined Merrill Lynch as a Financial Consultant. In 1989, he joined Legg Mason taking on the additional role of sales manager of the Pikesville branch. Allen’s extensive business experience is a critical element of his high quality advice and service. Within Legg Mason, Allen was well regarded for the training he provided for new Financial Advisor trainees on the topic of “Building Client Relationships.” Two years after Legg Mason traded their Private Client Group to Smith Barney, the entire Robinson team left Smith Barney to join Wachovia Securities, now Wells Fargo Advisors, where they remained until joining Janney in 2017. Sandy joined Legg Mason’s Retirement Services Division in 1989 where she served as the Regional Retirement Coordinator for the Baltimore-Washington area. In that capacity, she helped implement 401(k) and 403(b) plans for various corporations and non-profit groups, as well as individually tailored retirement plans for professionals. Sandy holds a Chartered Retirement Plans Specialist designation as well as being a member of the National Association of Plan Advisors. Recognizing her experience in the critical area of ERISA and retirement planning, Allen invited her to join the Robinson Investment Group in 1998. In addition to her focus on retirement planning, Sandy works closely with our high-net-worth clients in the areas of portfolio construction, risk management, and investment planning. Sandy earned her CERTIFIED FINANCIAL PLANNERTM designation in 2002. Marvin came to Janney from Wachovia Securities, now Wells Fargo Advisors, where he had been since 2008, after more than two decades with other Wall Street firms. Prior to his career in finance, he taught math and science on the secondary level, and also owned and operated several businesses in the Washington, DC, area. Marvin focuses on the area of portfolio risk management, with special attention to tactical asset allocation. Marvin’s undergraduate degree is from Virginia Tech, and his graduate work was at George Mason University and the University of Virginia. He and his wife Lyn live in Lewes, DE. As a graduate of University of Maryland - College Park, he prides himself in working for a firm that puts you first. Backed by the resources of Janney Montgomery Scott, he can help you make informed decisions based on your needs and goals. He strives to help each one of his clients plan for a financial future rooted in a clear and consistent investment philosophy and strategy. Working with our Retirement Income Evaluator, he creates a way for you to sit in the driver's seat of your own retirement and personally test the fit and feel of a number of plans to find the best one for you. Janney’s Baltimore office is located at 2800 Quarry Lake Drive, Suite 160, Baltimore, MD 21209, and can be reached at (410)-580-5020 or toll-free at (866)-366-7598.